Tipbet, renowned for its online sportsbook and serving sports betting enthusiasts for over two decades, offers a range of appealing gambling products through its desktop website as well as its mobile platforms. To increase its exposure in the online betting market, the company developed its exclusive Tipbet Android app to allow punters to indulge in an excellent online betting experience through the use of their mobile devices. Ideally suited for most Android devices on the market, Tipbet incorporated its desktop sports betting, live betting, live casino, online casino, and virtual betting into the design of its Android app. The overall layout of the site comes across as incredibly stylish, yet remains highly practical to ensure that both newcomers and sports betting veterans can find their way around with relative ease. Although the Tipbet Android app is currently not available on the Google Play Store, you can still download the app through a .apk file. If you are not sure how to download the Tipbet .apk file, you are more than welcome to follow the procedure provided below. Choose your preferred mobile web browser to visit the official Tipbet website then locate the download link for Android. Once you have clicked on ‘Download’, your Android device could potentially provide a security message notifying you the phone’s security settings is currently blocking your download. The reason this occurs is due to the fact that the .apk file is not recognised as originating from the Google Play Store. Once this message appears, click on ‘Settings’ and search for ‘Unknown Devices’. Activate this setting on your Android device to allow the .apk file to continue downloading and then the subsequent installation of the app. After installation completion, open the app and log in as normal using your account details. The Tipbet iOS app is essentially the same as the Tipbet Android app, providing its users with the same exhilarating online betting experience thanks to an excellent variety of sports betting opportunities coupled with an assortment of additional gambling products including virtual betting, live casino, online casino, and in-play betting. The main difference between the two apps is that the iOS app is much easier to download as you’ll be able to find it directly from the App Store. We also included a step-by-step download procedure to make things a little easier for you. Search for the App Store on your iOS device and open it. Once its open, search for the magnifying glass at the bottom of the screen and type Tipbet. Once the Tipbet app is located, click on ‘Get’ on the right-hand side to automatically download the Tipbet iOS app. After completion of the Tipbet iOS app download and installation, open the app, create an account or use existing details. The mobile version of Tipbet provides the same unforgettable online betting experience and innovative features as that of their dedicated mobile apps. The mobile version allows you several viewing options including light and dark themes, and with each, access to all betting options is identical. The only downside to the mobile version is it might suffer from lag due to connection and bandwidth issues when you are accessing the site while on a weak signal. Another problem punters experience is the fact that the mobile version is heavily dependent on RAM and other internal limitations imposed by outdated mobile hardware, so older mobile devices might not be ideal when you want to bet on sports on the go. If this is experienced, it can be corrected by downloading the latest software updates for the mobile device you are using. Tipbet provides not one, but three different cash out options, including Full Cash Out, Auto Cash Out, and Partial Cash Out. The cash out options allows you to secure a profit by limiting your risk. It essentially gives you more control over your betting activities when feeling unsure if your placed bet will result in a favourable outcome before the sporting event has ended. In-play betting lets you place bets on sporting events that are currently underway. All odds during in-play matches are updated in real time, and you can follow the results of the match by logging into your account. As a convenience factor, in-play betting can be coupled with the cash out option that only adds to its value. Tipbet also covers a vast selection of virtual sports betting. This affords you the luxury of betting on electronic games that produce visual feedback on your mobile device. These games essentially originate from fantasy sports and are software simulations for the purpose of sports betting. This includes Football, Basketball, Horses, Dogs, and Tennis. Tipbet features multiple betting options to enhance further the experience and environment that extends beyond sports. While the selection of available sports betting options is extensive and encompasses all major sports such as ice hockey, soccer, football, golf and boxing, the other less popular games provide a balance that includes MMA, snooker, table tennis and winter sports to name a few. Complementing the betting markets consists of an online casino, live casino, virtuals, live betting and eSports. The biggest attraction at Tipbet is obviously sports and punters will be pleased to know that Tipbet covers a decent selection of sports to keep you coming back for more. On the mobile version and mobile apps, you find Soccer, Tennis, Basketball, Ice Hockey, Handball, Volleyball, Cricket, American Football, Baseball, and more to place bets on. However, the real value, from an experience point of view comes as a result of the ability to being able to filter sports by Today, 3 Hours, 24 Hours, or 3 Days. Additionally, each sporting event you select will provide additional sections where you can choose a specific event. For instance, with Soccer you will find the Champions League, Europa League, International, Germany, England, Spain, South Africa, and Cyprus that essentially gives you every tournament and location where soccer is being played. You can also toggle between Favourites, Highlights, Last Minute, Statistics, and Results which are all categories listed at the top of the sports betting section for a more in-depth analysis of your popular sporting events. Apart from the fantastic sports betting section, the Tipbet casino app provides access to a respectable list of software developers. The casino is home to more than 500 casino games that are provided by world leading software developers such as WeAreCasino, TomHorn, Spinomenal, NetEnt, GameArt, Booming Games, and Betsoft Gaming. Casino enthusiasts will be able to choose from modern video slots, traditional slot games, table games, video poker and a selection of speciality games. What’s even more remarkable is that the online casino also features over 90 different live casino games, and that allows you to immerse yourself with professional and friendly live dealers on games like Dream Catcher, Live Blackjack, Live Dice Games, Live Baccarat, and Live Casino Hold’em. Comparing the mobile version of Tipbet against the mobile apps is rather pointless if you compare them at face value. 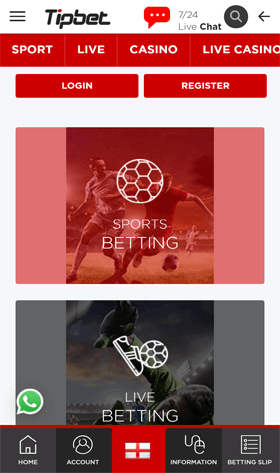 Both the mobile version of Tipbet and the apps provide the same layout structure and the same graphical content in terms of promotional banners and sporting events on offer. The only differences you’ll find is when you look behind the scenes at the performance and system requirements of the two. To make things a little easier, we included a table for each mobile platform and provided disadvantages and advantages inherent to both. The Tipbet mobile version and Tipbet mobile apps for iOS and Android should function correctly on any smartphone or tablet device that is around today. However, if you are concerned that either might not work on your hand-held device, you will be pleased to know that we included the necessary information to give you a better idea of the minimum requirements to operate either mobile platform. You might not find a specific mobile bonus or promotion at Tipbet, but once you take a look at promos as a whole, you quickly understand why, and how that benefits you going forward. This is because newly registering player bonuses and promotions are cross-platform based, therefore meaning all can enter and take advantage of offered promotions, regardless of which you use. For starters, newly registered players are welcomed with a generous sports welcome bonus. Those preferring to the casino will be met with equally attractive offers, all of which is geared to provide newly registered customers with a red-carpet experience. Tipbet provides an excellent betting platform, and as a result, provide an equally extraordinary range of payment methods to ensure you can quickly and effortlessly carry out transactions on your account. Below is a complete list of all deposit/withdrawal payment methods for both the Android/iOS app, mobile and desktop site. Are Tipbet’s mobile apps and mobile version safe and secure? Definitely. Tipbet utilises the most sophisticated SSL encryption technology which safeguards your personal and financial data, whether you are in the online casino or the sports betting section. Are Tipbet’s mobile services licensed? Of course. Tipbet is subject to the licensing and regulatory requirements of the Malta Gaming Authority which regularly evaluates all site safety and security measures. Besides, the bookmaker is subject to regular audits by independent auditing companies to ensure the safety and security of all systems and procedures. Is there an in-play betting option at Tipbet for mobile users? Yes. Tipbet offers a fantastic in-play mobile betting platform that will allow you to place bets on a vast selection of sporting events while the game or match is on. Even when on mobile odds also update in real time during each match. Do I need to download the mobile apps to access Tipbet? Yes. However, if you don’t want to download any additional software on your mobile device, you will be pleased to know that Tipbet also comes with a full mobile version of the site that provides the same online betting experience. Does Tipbet offer a cash out option on mobile? Yes. In fact, similar to its desktop counterpart there are three different mobile cash out options, including Full Cash Out, Auto Cash Out, and Partial Cash Out. This will give you more control over your betting activities as you can cash out before the game or match ends. Does Tipbet offer virtual sports betting on mobile? Yes. Tipbet comes with a virtual sports betting section that offers Football, Basketball, Horses, Dogs, and Tennis within the virtual sports betting section. Headquartered in Gzira, Tipbet is a reputable online gambling company based in Malta and has grown quite significantly over the years since it opened its virtual doors in 1995. The online bookmaker delivers a decent selection of sports betting events and betting markets and comes equipped with virtual sports betting, live casino, an online casino, and live betting opportunities. The site is licensed and regulated by the Malta Gaming Authority and offers seven different languages to accommodate punters including English, German, Turkish, Greek, Bulgarian, Croatian, and Macedonian. Although Tipbet does not offer a live streaming platform as of yet, the mobile apps and mobile version of the site offer a truly memorable betting experience. Punters can look forward to an impressive selection of sporting events to bet on as well as a wide variety of promotions and bonuses to claim while on the move. The overall presentation of the site is modern, uncluttered, stylish, and very appealing, complete with an online casino, live casino, virtual sports betting, and in-play betting opportunities. We, therefore, give Tipbet 8/10 for their mobile portals.